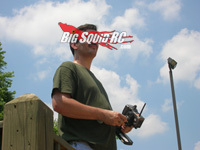 ASK Cub Reporter, 03.22.2013, Version- You Ask Legit Questions, I Give Bogus Answers, It’s My Modus Operandi « Big Squid RC – RC Car and Truck News, Reviews, Videos, and More! Hi I have an hip e savage and I want to convert it to brush less and I was wondering if the radient reaktor 3500 kV combo would work? Cubby– Yo to the yo Ryan G, thanks for the email and shoot Brian your snail mail so we can hook ya up with a BigSquidRC sticker pack. So you have a Savage that’s so cool it’s hip? I kid, I kid, you have an electric HPI Savage and you want to know if the Radient Reaktor brushless system we reviewed a few weeks ago will power the beast. The answer is Yes, but… not for very long. No, I have not tried the Radient in a Savage first hand, but I’m fairly confident from years of experience that it just won’t work. The Radient Reaktor system was not designed to power a vehicle as heavy, or with as much rotating mass, as an HPI Savage. To reliably power the Savage day in and day out it will take a larger motor and a speedo capable of handling such high power demands. So… I won’t leave ya hang’n bro, I’ll give ya an affordable alternative that should work. We reviewed an 8th scale Kershaw system a long time ago, it was one of their “Gen 2” 8th scale power systems and it worked well for us. Kershaw doesn’t sell the “Gen 2” system anymore, however they have “Gen 3” 8th scale systems starting around $150. You might want to hit’em up with an email and say you are looking for crazy power for your Savage on the cheap. Oh ya, tell’em Cubby said “What’s up”. What do you think about those car action reader choice awards? Are they fake or what? It seems like every year they end up with some bullsh&* winners that nobody would ever vote for. Cubby– What’s up Benji? Do you always ask such loaded questions? Haha, good for you for not holding anything back. I won’t hold back either. I have zero, absolutely no “first hand” information that there is anything bogus about the RCCA awards. I don’t know how the voting works, or what categories there are, I basically know nothing about them, let alone about anything fishy going on.. About the only thing I know about them is they named a motorcycle as “car of the year” a few years ago. We still laugh about that one around the office. However… there have been rumors floating around for years within the industry. Maybe they were started after a touch of jealously by a company that lost, or maybe they were just started by someone look’n to stir the pot, I have no idea. 1. I have no idea why you even care about who-wins-what in the dinosaur media. You really should move into the internet age. If you took the time to write me an email then obviously you know where the internet is, use it. 2. We do see surprise winners every year during our March Bashness tournament. For example, some very heavy hitter Traxxas vehicles have bit the dust early when every single person in the office expected them to make the final 4. Upsets do happen, and products that you or I think are extremely popular might not actually be. With all that said, our own March Bashness tournament is now underway, and I can give you 100000% certainty that it’s legit in every way. Click the vote buttons and show the world which vehicles you think are the best. Click HERE to go VOTE NOW! That’s it for this week gang, hit me up with your questions, answers, psychopathic rants, and whatever else you have stewing in that mind of yours to Cubby at BigSquidRC dot com. If your questions hits the big time you get free stickers, and if you are extra special and I proclaim yours as “letter of the month” you’ll get a free t-shirt.